There then occurred to me the “glückischste Gedanke meins Lebens,” the happiest thought of my life, in the following form. The gravitational field has only a relative existence . . . . Because for an observer falling freely from the roof of a house there exists — at least in his immediate surroundings — no gravitational field. Gravity’s pull is roughly the same on you in all of these instances, since your distance from the center of Earth (which determines the strength of gravity) doesn’t change that much. Yet your weight — your own personal sensation of heaviness, as well as what a bathroom scale measures — increases and decreases according to your motion, specifically your acceleration. To phrase it another way, we feel acceleration, but we don’t feel gravity. As the Einstein quote above indicates, if you’re falling freely, as out of an airplane in a skydive, you won’t feel the pull of gravity as you fall. Air resistance, yes, but not gravity. 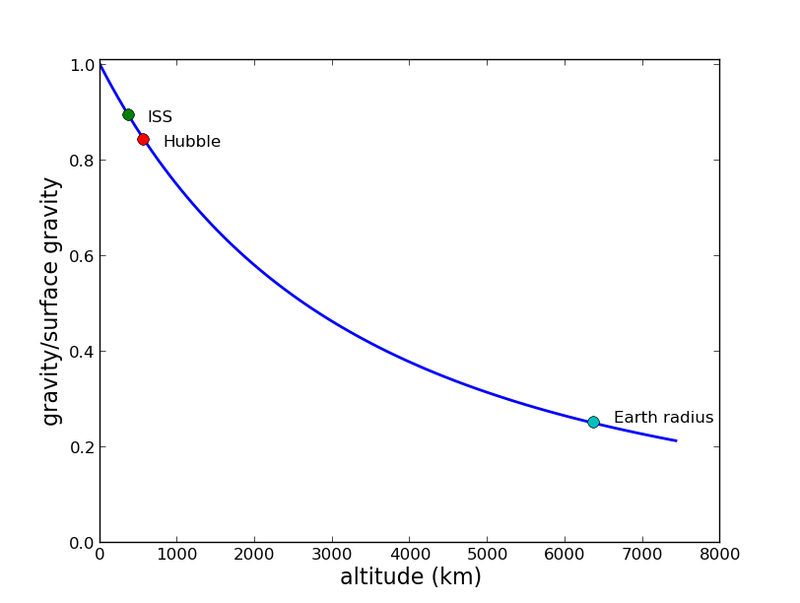 The strength of gravity as a function of altitude above Earth’s surface. The ISS orbits at 370 km altitude, where the gravitational strength is about 90% of its value at the surface – hardly zero gravity! The effect is most prominent for those fortunate enough to go into space: they are continuously weightless while in orbit. According to Mary Roach in Packing for Mars, some astronauts never get over the nausea and disorientation that often produces. (That nausea is also the source of the astronaut training airplane’s nickname: the Vomit Comet.) Normal scales are useless: if they want to measure their body mass, astronauts must use a calibrated spring mechanism, a fun subject I’m writing about for a Super Seekrit Project. Gravity isn’t zero, though, or else the spacecraft wouldn’t stay in orbit. In fact, as you can see from the plot above, the gravitational strength at the altitude of the ISS isn’t much less than it is at the surface. Of course, that means the common phrase “zero gravity” is false. It does contain a kernel of truth, though: if you are moving under the influence of nothing except gravity, you won’t feel anything, the same as you’d feel if you were out in deep space far from any galaxy. (The term “microgravity” is widely used now for that reason.) Nevertheless, the paths you would follow in those environments would be different, the result of gravity’s shaping of the geometry of space. Einstein’s “happiest thought” led him to a new theory of gravitation, the general theory of relativity. The answer is simple: weight is what you measure with a scale. That’s it. It’s not an absolute quantity, independent of state of motion. The reason you feel weight while standing is that the ground pushes back, thanks to molecular forces (derived from electric interactions), and your body naturally distributes that force throughout your frame. The same applies for sitting or lying down. You’re weightless in orbit or in other free-fall circumstances because your spaceship is falling at exactly the same rate you are: there’s no way for it to push back against you, meaning the true forces responsible for weight aren’t active. Of course, we could say that weight is the same as the force of gravity, meaning that you aren’t weightless in orbit. Some introductory physics textbooks conflate the two concepts, and I even had an argument with my former department chair about it. Their take: it’s too complicated to separate weight from gravity. My take: you have to jettison intuition and experience, as well as general relativity to do so. However, weight as the distribution of forces through the body has several physiological effects. For example, if you linger in a weightless environment, your bones will begin losing density at an alarming rate, akin to an advanced case of osteoporosis. International Space Station astronauts lose between 1 and 2% of bone mass per month in orbit, so extended stays aboard the ISS lead to extended recuperation periods upon return to Earth. Even sedentary, bedridden people experience some bone loss on Earth because the distribution of weight is different than for upright postures. In fact, it was an article about such bone loss that triggered this piece. (Tip o’ the pendulum to Peter Newbury for sending the article my way.) I assume the physiology in that post is fine, given the source, but it’s incorrect on a crucial point: it’s not lack of gravity that causes the problems. Human bodies evolved to deal with the consequences of weight: everything from skeletal structure to the circulatory system is well adapted to life on the ground, with the distribution of forces that implies. Planning for long trips to other worlds, such as Mars, would require understanding and compensating for bone loss and possibly other physiological changes. Mars’ gravity is only about 38% of Earth’s, so a person standing on Mars would only have 38% of the weight they have on Earth. The trip itself would be mostly weightless (at least as far as modern propulsion technology allows), since it doesn’t matter if you’re in orbit or en route between planets: the presence or lack of gravity isn’t the issue. To close, here’s a song about a weight of a different sort, performed by a few of my favorite musicians.